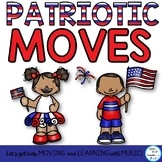 Patriotic holidays are a great holiday to sing and read about because the songs also connect to lessons on citizenship and learning about patriotism. Why? Singing helps students develop an emotional connection to the words and the meaning of the song. And, students love to learn about their country, the flag, the Presidents, Veterans, well, anything about America. Why not use this love of country and singing to help them become better readers? Here’s four ways singing Patriotic songs helps kids learn to read. I love combining music and literacy activities. Students love to read the rhyming words and the lyrics of the songs projected on the smart board. Holiday themes are especially exciting to them. Why not sing your way through all these fun holidays? Can’t sing? That’s okay-use the songs as poems and chants. I’ll bet that you have singers in your classroom. Children love to sing. So here are my four reasons why singing patriotic songs helps kids learn to read. Ultimately, providing diverse learning opportunities is also a great way to enhance reading skills and encourage social skills. I’ve grown to love creating literacy activities that incorporate music because I’m such a big believer that it WORKS! How about using the song “Yankee Doodle Went to Town” is a great example of the need to explain the vocabulary and then connect to the rhymes. First, the students are going to need to know a little about the history of the song. If you’re teaching primary students, you’ll want to share a very short version of the background of the song. Here’s what I tell my students. The melody to the song is very old. It was popular in England, Holland and France and even Spain. At first, when the British soldiers fought the Americans they sang the song to make fun of the Colonial soldiers. The British sang the song up until 1781 when the Americans changed the lyrics to make fun of the British. The song is now a favorite American folk song. Yankee Doodle went to town, riding on a pony. Stuck a feather in his hat and called it macaroni. Yankee Doodle keep it up! Yankee Doodle dandy. Next you’ll want to get your students reading the lyrics. It’s a good idea to have the students read the lyrics to a song aloud. Help them decode the words and discuss the vocabulary. Macaroni- Wigs to begin with and then later anything “fashionable” in England. Dandy- someone who thinks that wearing the latest clothing style is more important than people. Consider having students write the words and meanings and then sentences to help them solidify their skills. 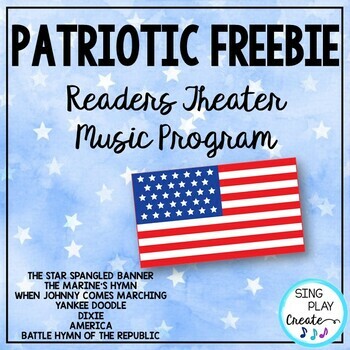 Try this blog post with some ways to help students sing Patriotic songs. Since songs have rhyming words, singing rhyming words will help them recognize and become familiar with rhyming sounds. Next have students point out the rhyming words. As part of your Literacy activities, you can have students point out and read all of the rhyming words. As part of a literacy center students can make a list of different rhyming words. And more advanced students might be able to compose a few short lines and make their own song or poem. Idea! Have students come up with more words that rhyme with these. How about using “knee”, “bee”, “funny” to show that different letters have the same sound? Looking for an easy way to integrate music into your reading program? This Patriotic Bundle of Literacy Activities is a Forever Freebie in my TpT store. Sing the song enough times to ensure students have memorized the lyrics. Try these ideas after they know the song. Create hand moves and actions to express the lyrics. At first allow students to move freely to the music. Next ask students to create specific moves that show the story. Finally, have the students put the actions together with singing. Then have them perform their creations. President’s Day is a great holiday to sing and read because it also supports citizenship and learning about patriotism. Check out this Freebie literacy and coloring where students can use the circle maps and writing activities to learn about Presidents Day. Students will love figuring out which coin matches the President. There are 3 sheets. 1 for Lincoln, 1 for Washington and 1 with both. Students fill in the Name and the Coin. Use as morning work ! 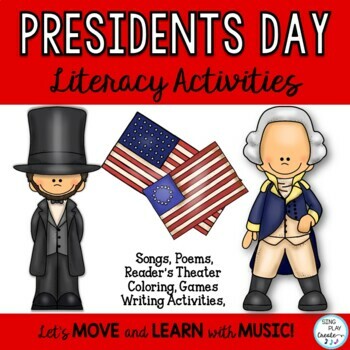 Looking for more Patriotic themed Literacy activities?This President’s Day Literacy Resource is perfect for February Literacy activities. In the February Combo literacy activities resource, there’s 17 songs for Presidents Day, Groundhog Day and Valentine’s Day. The songs are set to familiar tunes. Super flexible and adaptable to meet your teaching needs. You can use them as chants or poetry or songs. Each song has a cute color printable. There is also a readers theater for Presidents Day. Using songs, poems and writing activities in your classroom is a great way to build literacy skills while connecting to relevant and fun experiences. Singing songs together creates positive feelings for kids. When your students love the language, they’ll feel more confident in their reading activities. Listening to a story and then singing the songs compliment language development. It’s all about the brain connections. Every time the student sings they engage established connections and develop new ones. Experts agree that singing and reading work together to build strong language skills. I hope you’ll try implementing more music and art experiences that connect to the literature. I know that these connections and activities will help your students develop a broader vocabulary and learn to love reading. Remember, singing is a great way for students to fall in love with words. Try reading the lyrics to the songs as if telling a story as this technique will add a bit of drama and help students gain more interest in reading the words. You don’t have to have a great singing voice. It’s the feelings of “togetherness and belonging” singing inspires that will bond students to you and learning. If students love to sing and learn songs-chance is that they will love to read too. Singing songs and then participating in learning activities that center on the songs, provides many diverse opportunities for students to gain confidence in their language skills. Singing also creates an emotional response which will help the student feel good or “love” reading too. Not only have studies proved it, but once you use music and literacy activities in your classroom, you’ll be hooked on this fun method of helping students to learn to read. Looking for ways to integrate movement, music and literacy? 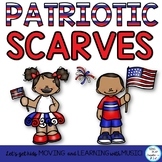 Try PATRIOTIC MOVES and PATRIOTIC SCARVES for students to not only burn out some wiggles and re-energize but to exercise gross motor skills. Both activities features cross body movements which helps students read better. Like this blog post? Please share with your friends!